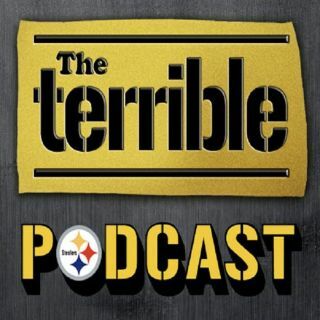 Season 9, Episode 101 of The Terrible Podcast is now in the can and in this Tuesday show, Alex Kozora and I immediately talk about the recent social media exchanges between Pittsburgh Steelers wide receiver JuJu Smith-Schuster and his former teammate, wide receiver Antonio Brown, the last few days. The Steelers have now signed five former AAF players as of Tuesday morning so Alex and I bring everyone up to speed on those transactions and which ones show the most promise in our opinions. The Steelers have had a few more pre-draft visitors in since the Friday show was posted so Alex and I go over that list once again. This includes us talking about two of this year’s top cornerbacks in Georgia’s Deandre Baker and Washington’s Byron Murphy both being brought in. Alex has now rebooted a series related to what the Steelers look for at certain positions as far as draft measurables go so we look go over his recent findings for the inside linebacker and wide receiver positions. Are the Steelers destined to draft either Notre Dame’s Miles Boykin or West Virginia’s David Sills V? Alex and I spend a good bit of time going over both those players in addition to a few more wide receivers as a result of his recent study. How big of role do the college All-Star games play in the Steelers drafting wide receivers? We discuss that topic for a bit. Steelers linebacker Ryan Shazier cleared another hurdle recently as far as his rehab goes so Alex and I make sure to highlight that great news later in this show. Please sit back and enjoy Episode 101 of Season 9 now of The Terrible Podcast.